"Our People Make the Difference." Please download our smartphone app. Our app allows you to manage your entire family’s prescriptions, order refills, set medication reminders, and find pharmacy location information. 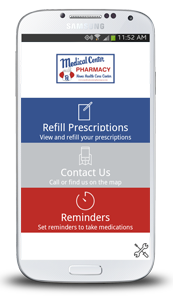 Medical Center Pharmacy makes refilling your prescriptions convenient and quick with the use of this app on your device. There is no charge to download and install the app.